Coltsfoot herb eases respiratory problems and is an essential ingredient of cough mixture because it softens mucus in the bronchi and helps eject phlegm from the lungs. Its medicinal effect is known to herbalists worldwide. It has a Latin name Tussilago farfara. Since ancient times, the coltsfoot tea was used in popular medicine for the treatment of cough, hoarseness and a number of other respiratory diseases. However, just as it is an excellent natural remedy for headaches, diarrhoea, it helps with sore throats. Read on to learn more about this remarkable plant. Coltsfoot is a perennial plant that has been for thousands of years used in Chinese folk medicine. In some parts of the world it is known as a horse hoof, and is originally from Eurasia. It grows along streams, ditches and embankments along the banks of the river, as well as by the railways. Its yellow flowers, which appear in early spring are reminiscent of beneficial dandelion. The stems of 15 cm in height emerge in the early spring months, and flake leaves are covered with soft hairs. Each leaf has a horseshoe shape, above is green, and silvery on the bottom. Characteristic of coltsfoot is the fact that the leaves grow after flowering. During plucking you should choose leaves that are palm-sized, clean. Before drying you should not wash them but only chop as much as you can, because in this way they do not lose valuable medicinal properties. Coltsfoot plant is a good source of iron, potassium, sodium and sulphur, as well as vitamins A, B and C, which are mostly in leaves. Also, all parts of the plant are rich in mucus, contain tannin, gallic acid, inulin, choline, malic and tartaric acid. The flowers of horseshoe contain phytosterol, which is the chemical structure similar to cholesterol. Coltsfoot tea has a far greater application in folk than conventional medicine. It is considered the best natural remedy for respiratory ailments and is indispensable in the tea mixture for cough, because it softens mucus in the bronchi and helps expectoration. Coltsfoot tea stimulates mucus secretion and soothes inflammation and helps in the treatment of bronchitis and pleurisy, and it is proven to be an excellent means to ease, calm and treats asthma attacks. This medicinal preparation is used for rinsing the mouth and throat. Also, it has a beneficial effect in the case of pneumoconiosis - that is dust in the lungs. This herb has anti-inflammatory, antioxidant and antibacterial properties. It has been proven that it cleanses the blood and accelerates the expulsion of excess fluid from the body. Thanks to the combination of mucus and tannins in its composition, coltsfoot tea is a good remedy for diarrhoea. It is beneficial to intestinal health and stomach ulcers, and relieves symptoms of irritable bowel and ulcerative colitis. Antimicrobial properties make this plant suitable for the treatment of inflammation of the bladder and other urinary tract infections. Coltsfoot plant, among other things is a beneficial natural remedy for the care and treatment of the skin. Its medicinal properties accelerate the healing of wounds, and is effective in the case of eczema, ulcers and with insect bites. Reduces oxidative stress on the skin and makes it youthful. In addition, the high content of mucus helps fight dandruff and has a beneficial effect on dry and oily hair. We have prepared some fabulous recipes that you definitely need to try. NOTE: before applying any products, consult with your doctor. Mix equal parts of leaves and flowers of Coltsfoot, lungwort leaves and plantain. Two teaspoons of mixture pour over with 2.5 dl of boiling water, cover and leave it to rest for a while. Drink daily three cups of tea, slowly in small sips. If desired, sweeten with homemade honey. Mix 25 g of leaves and white mallow, coltsfoot and fruit of fennel, and pour a spoonful of the mixture with a cup of boiling water, cover and leave it to rest for a bit. Then strain and drink warm. Sweeten the Coltsfoot tea with honey and drink four to five times during the day. Mix 20 g of anise and Coltsfoot flower and 60 g of leaves. Three tablespoons of the mixture boil for about ten minutes in half a litre of water and leave it to stand overnight. Drink during the next day instead of water. Mix 20 g of corn silk, leaf and flower of mint and leaf of coltsfoot, thorn apple and henbane, and spray it with a solution of potassium nitrate (2.5 grams in 2 dl of water). Smoke one or two cigarettes a day if necessary. This is the recipe of the famous academician Dr. Jovan Tucakov. 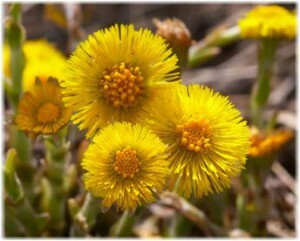 Coltsfoot tea in combination with marigold flowers achieved good results in the treatment of alopecia. Mix 20 grams of Coltsfoot root and 10 g of calendula flowers. Mixture pour with a litre of boiling water and allow it to boil for about 15 minutes. Then strain well, and use hot tea twice a week, rub your head. Mix 20 g of fenugreek seed, mint leaf and flower of coltsfoot, white and mallow. Four tablespoons pour with 5dl of boiling water, cover and leave it to stand for at least two hours. Thus obtained coltsfoot tea, strain and drink instead of water. Mix 25 g of chamomile, white blossom and mallow and coltsfoot, and one tablespoon of the mixture pour with 2 dl of boiling water, cover and leave to stand for more than 2 hours. Strain the tea mixture and rinse the mouth and eventually swallow it. Today coltsfoot tea can easily be found in herbal pharmacies, and even in the better-equipped health food stores. It is best to get it in bulk, but as a finished product, the drink is also available in filter bags. Be sure to find and read the declaration on the label, so that you determine the composition of tea. The price is not expensive and it is 2 dollars for a pack of 50 grams (bulk), you will agree with us that it is favourable. It is possible to order it via the Internet, which is the simplest method. Whichever option you choose, always read the declaration. Given the fact that the plant contains alkaloids that are poorly soluble in water, you should be careful when using it because it works hepatotoxic, genotoxic and is carcinogenic. Therefore, coltsfoot tea can be used in strictly defined doses 3 to 4 cups day, not a day longer than a month. These alkaloids are harmful to the liver, and the use is not recommended for people who have problems with this organ. Also, Coltsfoot tea during pregnancy is not recommended and should not be drunk by the children under two years of age and lactating women.